"Pray as though everything depended on God. Work as though everything depends upon you." Photo Credit: Jacob Marquart, O.F.S. Religious name: Brother Tarcisius of the Blessed Sacrament, O.F.S. Jacob has been a member of the St. Augustine Church staff since September 2014, and has become irreplaceable with the administration, day-to-day operations, scheduling, and organization of the Parish. After spending 10 years in hotel management around the country and then 20 years working in clinical healthcare management, Jacob discerned another calling in his life. In 2010, he began employment with the Archdiocese of Philadelphia. He worked for three years at St. Joachim Church in Philadelphia as the Parish Services Director until it was closed and merged in June 2013. Jacob was then employed at the newly merged St. John Cantius Church in Philadelphia and worked concurrently as the Parish Services Director, Business Manager and Director of Religious Education. Jacob has also ministered at St. Thomas Aquinas Church in Croydon, PA for three years as the Director of Religious Education, as well as two years at Our Lady of Ransom Church in Philadelphia, PA as the Director of Religious Education, R.C.I.A. & R.C.I.C. In May 2012, Jacob became a graduate of the Church Ministry Institute at Saint Charles Borromeo Seminary as an Ecclesial Minister. He continued his theological studies at the seminary in the Graduate School of Theology and graduated in May 2015. As a Permanently Professed Brother of Penance of the Franciscan religious order, Order of Franciscan Seculars (a member of the Saint Katharine Drexel Region, its local fraternity community, Saint Bonaventure which is attached to the Province of the Most Sacred Heart of Jesus, Franciscan Friars of the Third Order Regular [T.O.R.] in Loretto, PA ), Jacob strives to observe and live the Gospel of our Lord Jesus Christ by following the example of St. Francis of Assisi who made Christ the inspiration and the center of his life with God and people. Jacob currently resides in Philadelphia and in his free time enjoys sacred and classical music. He spends much time at the Kimmel Center for the Performing Arts with the Philadelphia Orchestra (who by the way, had their very beginnings in 1900 right here at Saint Augustine Church from our parish musicians). Jacob is classically trained on the clarinet, violin and piano. He also enjoys finding new restaurants and dining with family and friends, cooking and traveling to distant lands around the globe to discover its peoples, customs and cuisines. Kim has been a member of St. Augustine for over 10 years, and serves as the Music Director, coordinating the music for liturgies, directing the choirs, and playing for liturgies and services. Born in the Philippines, Kim Rojo Celestino Barroso began his piano study at the age of 4 under the tutelage of his grandmother, Anita Celestino. Soon, under the guidance of Marina Diokno, Kim entered the Philippine High School for the Arts. There he continued his studies with Araneta Lim and Regalado S.L. Jose, who conducted his Graduation Recital performing with the Manila Philharmonic Orchestra at the Cultural Center of the Philippines. At Regalado Jose’s suggestion, Kim took lessons from Bien Panganiban, founder of the Ryukyu Academy in Okinawa, Japan, who suggested Kim apply for Winthrop University in South Carolina, where he became Kim’s benefactor. Under Dr. Eugene Barban, Kim graduated with Honors with a Bachelor's in Piano Performance, receiving First Honorable Mention for two consecutive years from the South Carolina Music Teachers National Association Piano Competition. Kim moved to Philadelphia to earn his Masters in Music degree from Temple University in Piano Performance and Piano Chamber Music Accompanying, where he studied with Harvey Wedeen and Lambert Orkis. Kim's work for the university landed him a position as an Artist-in-Residence working for the Choral and Vocal Departments, and pledged to performing and accompanying for various concerts, auditions and masterclasses. Kim also currently teaches a Piano and Musicianship class at Rutgers Camden University. Kim is a member of the Pi Kappa Lambda National Music Honor Society and Assistant Alumni Adviser for the Omicron-Upsilon Chapter of the Kappa Sigma Fraternity, which he helped charter at Temple University. Kim’s community involvement also afforded him the opportunity to be President of the Filipino American National Historical Society – Pennsylvania Chapter (FANHS-PA) from 2007-2010. He also currently serves as a Public Relations Officer for the Filipino Executive Council of Greater Philadelphia. 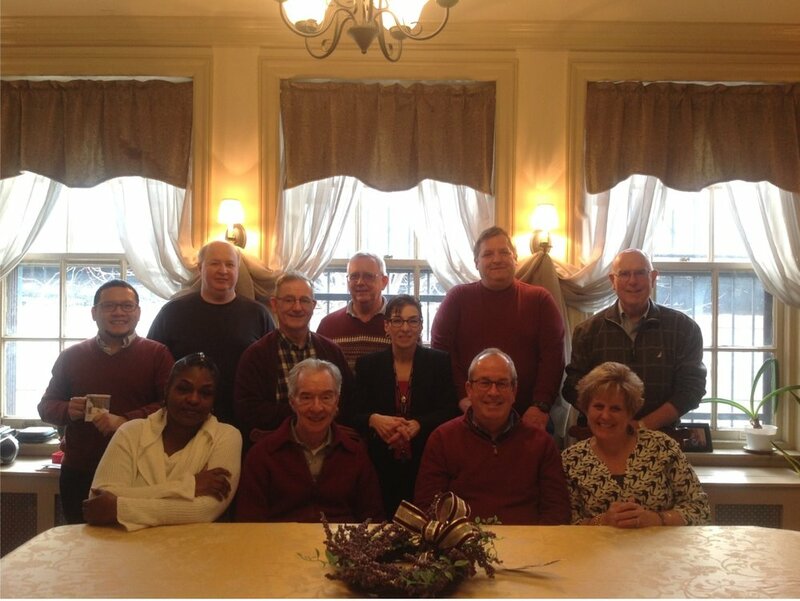 In the community, Kim is a house pianist for Larry McKenna’s New Voices Cabaret at the Society Hill Playhouse. He has been a music director and accompanist to several performances of local opera companies such as the Atlantic Coast Opera Festival, Opera Seabrook, International Opera Theater, Opera Libera and also for the Montgomery Community College’s production of Verdi’s Rigoletto. As collaborative pianist and soloist, Kim has performed with local orchestras such as the Ambler Symphony Orchestra, Olney Symphony Orchestra and the Orchestra Society of Philadelphia. He also has performed at the Mann Center for the Performing Arts, Carnegie Hall’s Weill Recital Hall, and sometimes frequents the home of Philippine Ambassador to the United States, Jose Cuisia, Jr., performing for U.S. and foreign dignitaries in Washington DC. Tim is the accountant at St. Augustine Roman Catholic Church, and was imported from Australia. He came reluctantly to St. Augustine on the recommendation of a friend who saw the job posting in the Sunday bulletin at another church, and thought that a part-time job might be a good retirement occupation. Father Jim McBurney apparently thought so as well, so Tim joined the staff in 2009. Previously, Tim had been the facilities manager for several technology companies. He was also Financial Controller for a hotel in California for several years. Having lived in several different cities, he finds himself returning to Philadelphia as a city that has many activities, good transportation, and (usually) pleasant weather. Jean is the Wedding Coordinator at St. Augustine Church, organizing and managing over 60 weddings every year. She joyfully helps non-parishioner couples during the course of their preparation for the Sacrament of Marriage at our historic Old City church, from scheduling the day, to gathering the correct paperwork, to cueing each bridesmaid in a stately walk down the aisle. Jean has worked at St. Augustine's for over five years, first beginning part-time work under Fr. Jim McBurney, OSA. Simultaneously, she worked part-time for National Shrine of St. Rita's on South Broad Street. As the years progressed, began working full-time as the Office Administrator at National Shrine of St. Rita's in South Philly, and was called back to St. Augustine's as Wedding Coordinator in 2013 under Fr. Michael Slattery, OSA and has continued her tenure up to today. Jean has been married for 30 years to Mario Mangini, and together they have three children and one beautiful grandchild. She is a parishioner at Annunciation B.V.M. Church in South Philadelphia where husband, Mario, also works part-time. Jean is involved with St. Pio Chapter of the Sons of Italy and St. Pio Novena and Festival annually in September. She worked as a paralegal from 1984-1996, and is also very involved with St. Katherine's Day School for Special Children with Disabilities where her youngest son, Antonio, is one of the students. Bob Zigmund is the Facilities Manager at St. Augustine Roman Catholic Church. He grew up in Northeastern Pennsylvania and moved to the Philadelphia area in 1994. He resides in Glenside, Montgomery County, PA. He has a great deal of experience in residential and commercial repairs, remodeling, and construction along with a diverse background in business, law, entertainment, and public safety services. He has also coached CYO Youth Basketball. May 24, 2018 - Parish Staff Meeting & "Remain In My Love"
Parish Staff Meeting discussing, "Remain In My Love." As requested by the Archdiocese of Philadelphia, we have been participating in the Initiative for the Renewal of Marriage and Family Life. Parish Staff & Friars Enjoying A Pre-Christmas Lunch at Estia Mediterranean Restaurant (Center City Philadelphia) after seeing the Nutcracker Ballet at the Academy of Music. The Rule of St Augustine, written in the 300’s AD, is the guiding force in our community life. Living the Rule of St Augustine calls us to be “of one mind and heart intent upon God.” We live in community to reflect the early Christian communities. As Religious, we profess the vows of poverty, chastity, and obedience. We are called to strive to live poverty by sharing all things in common and not claiming anything as our own. We live chastity by freeing ourselves to not reach out to just one family, but to all people we encounter. We live obedience by seeking out the needs of the Church and Order in serving others, not just attending to our own needs. The Augustinian Community at St. Augustine Friary share morning and evening prayer together each day. One morning each week, we share insights and reflections on the scripture readings for the upcoming weekend. Once a week we also read and reflect on a section of The Rule of St. Augustine, and once each month we celebrate the Eucharist together. We also plan one social evening a month with each other. Monthly community meetings (House Chapters) double as an opportunity to "check in" with each other on how things are going in our individual lives. Although each friar tries to have a personal annual retreat, we also plan two Days of Recollection each year as a community. Father Jim grew up in Newtown Square, Delaware County. He has an older brother who lives in the Chicago area. Fr. Jim went to Msgr. Bonner High School where he met the Augustinians. He entered the Order of St. Augustine in 1977, made his final profession of vows in 1983 and was ordained to the priesthood by Bishop John McNabb, O.S.A. of Chulucanas, Peru on May 12, 1984. During his first few years of ordained ministry, he spent teaching high school, first in Washington, D.C., then at Malvern Prep in Malvern, PA. In 1989 he began parish ministry. 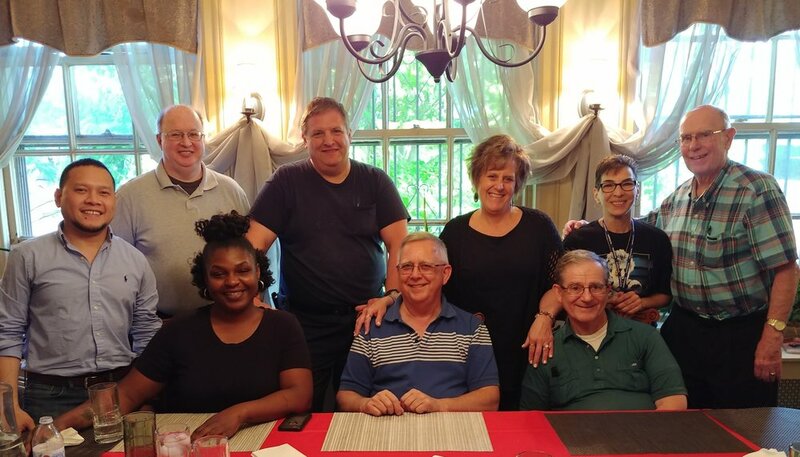 Since then he has served in Augustinian parishes in New York City, Orlando, Florida and twice in South Philly, first at St. Rita's from 1997-2000 and then, for the last fourteen years at St. Nicholas of Tolentine. Fr. Jim is interested in most sports, most especially baseball. He has been an avid Phillies fan since childhood. He tries to play golf. He likes music (played the clarinet as a youngster) and he likes to read. Father Paul was born in Philadelphia, the second oldest of 14 siblings. He attended Villanova University and graduated with a degree in Civil Engineering. After briefly working for Sikorsky Aircraft, Father Paul entered the Augustinians. 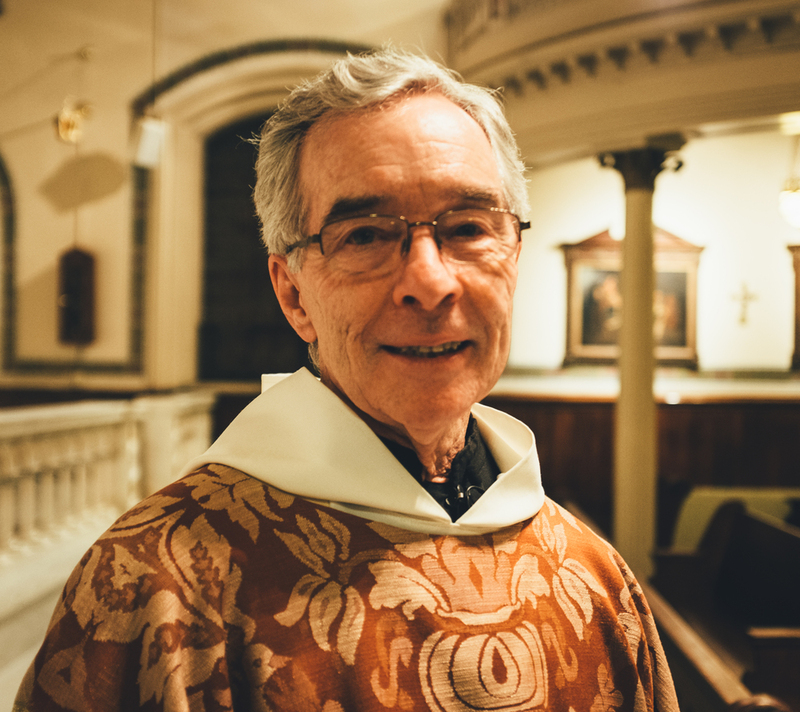 This year, 2016, he will celebrate 49 years of priesthood, the last 11 of which he has been at St. Augustine's. If you enjoy the gardens around the rectory, be sure to thank Father Paul. He diligently tends these green spaces, and particularly enjoys working in the Healing Garden on the bridge side of the church. This garden is dedicated to reconciliation in our hearts and our city. Father Paul has recently published his first novel, The Black Wall of Silence. He also provides spiritual direction and celebrates Masses. Additionally, he coordinates Adeodatus, a re-entry from prison ministry, named after St. Augustine’s son. Father Paul's favorite part about St. Augustine’s is that it is the historical root of the Augustinians in the United States. Fr. Jim is Prior of the local community of friars at St. Augustine Parish. Originally from Michigan, he came to know the Augustinians in his late 20’s through parish involvement while working in marketing/advertising management for several years in Philadelphia. At age 31, he entered religious life. He was ordained in 1991. For the past 5 years, Fr. Jim was Director of Novices for Augustinians in initial formation of the three North American provinces. Previously, he served in parish ministry, retreat work, campus ministry and teaching at Merrimack College in Massachusetts. For 8 years, he was Personnel Director for the Villanova Province and served for 12 years on the Provincial Council. Fr. Jim is a certified pastoral counselor and holds a Doctor of Ministry degree in Clinical Pastoral Psychology. Over the years he has worked with individuals, couples and groups, including those who have suffered trauma and great loss, to find wholeness and new life. Before becoming Novice Director, he spent 2 years working at St. Rita's Shrine in South Philadelphia to promote ministries of reconciliation and healing in the face of escalated violence in the city. He enjoys travel, biking, cooking and art & design. He is happy to be part of St. Augustine's which carries the vibrant energy of Old City and the passion for the Gospel for over 200 years!